As I write this, I’m a day away from turning 39 weeks pregnant. And I’m sat on the sofa, trying to stay productive and write and work and keep things tidy, but it’s a delicate affair between having insane bursts of energy, and then collapsing in a heap with unexpected exhaustion. Bill is with his dad today. He has, roughly, two days a week with his dad and has done for a while. That can change due to his dad’s shifts, but it’s usually around six or seven days per month. I suppose these are the days that I should be tucked up in bed and snoozing. Or reading a book. But I find that so hard to do. I look around our house and there’s always something that needs doing. And I find myself staring at a ‘problem’ and trying to work out just how much it would bother me if I left it. I know that, once she’s here, it doesn’t mean I’ll be incapable of doing things forever. But I have had it in my mind, for a long time, that this maternity leave and this time with my children, has to be better than the last time. That means soaking up baby cuddles, and funny chats with my big boy. Rather than trying to squeeze in some DIY around nap time. I just want us to all have our chance. Does that make sense? So that may be the reason why we’re trying to finish our bedroom, to some state, this week. I’ve shared snaps and photos before. But our room isn’t just a bit drab, or in need of updating. It has cracks in the walls. Curtains that are grimy and dusty and have been there since we moved in. A carpet that looks like it might have Mad Cow Disease. And paint flaking from the walls. Over the past few months Mark has worked so hard on his own to strip wallpaper. Wallpaper that is woodchip – which is standard in this house – and an utter terror to get off the walls. And he’s not let me help. Once. This weekend just gone he took to the walls with a sander, and Polyfilla, and slowly made his way around to get the walls as smooth as possible. We don’t have the money for the walls to be re-plastered. So we’re Team Lining Paper. It occurred to me, as I spend a lot of time in bed these days, especially early evening, that, as I was looking around, this bedroom would not be a happy or inspiring place to be with a newborn, at 3:00am. And it didn’t feel like the safest place for a newborn either. Renovation has taken its toll on our house – especially our bedroom, which has housed so much rubbish over the past nine months. And so I wanted to try and get this done, so we could curl up in bed, as a family of four, and feel comfy, safe and warm. But it is hard. Because I’m the driving force behind projects like this. And usually I’d be right in the thick of it, doing it all myself, or at least taking on an equal roll. 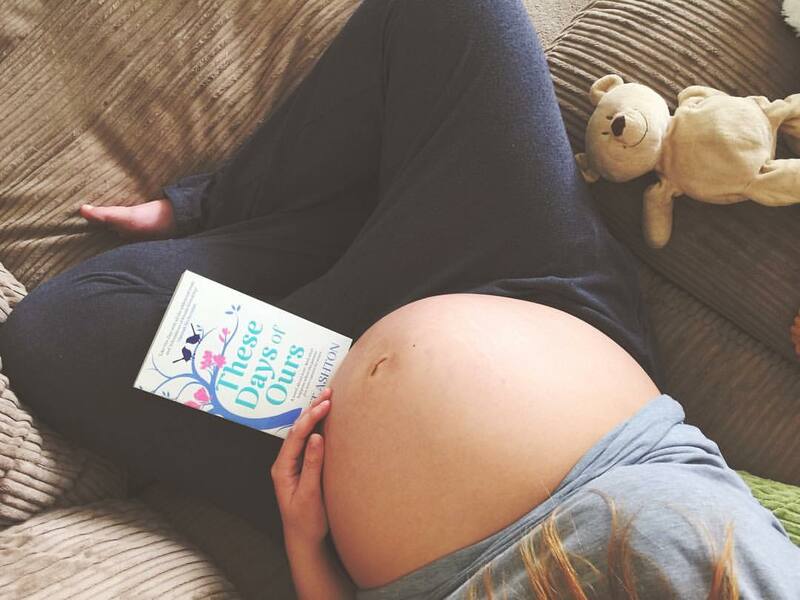 But when you are 39 weeks pregnant, it turns out that you can’t do as much (who’d have thought it!) and things take much longer. I do feel sorry for Mark, I have to admit, he’s spent a lot of his spare time doing so much and he’s going to be tired in the future too. Still, we’re getting there. Our bedroom, as with most rooms in this house, has been planned for a while. I have colour schemes, I have paint, lining paper, accessories, prints. You name it. I just hope that we can get it in some fit state so that, when I’m home, cradling a baby daughter, and stroking the fluffy blonde hair of my little boy, I have somewhere to go and look around and enjoy that milky newborn fug. Technically she’s not due for another week. 19th April 2016. A date etched in my mind for months now. But it’s a strange see-saw of wanting her to come, and wanting her to wait so I can get things ‘just right’. Other than that, my first week of maternity leave has been an up and down one. I’ve gone from feeling certain she was on her way – with all of the signs to go with it – only to be let down by my body. Each day seems to be a gamble. I either wake up feeling terrible, and I get slowly better. Or I wake up feeling great and then all of sudden I’m hit with discomfort, queasiness and sheer exhaustion. I’ve been trying my best to soak up every moment I have with my son, because I feel so emotional about the change coming our way. I know we’ll be beyond happy, and we will all adjust. But I still feel guilt. And I still wake up every morning hoping that I can find enough energy to be the mother he needs and wants me to be. And then there other things I have to do. Try and get bits of work finished off. Posts. Videos. Commitments. Things I feel like I should be doing, and hang over my head. But things that make me feel like saying: “Oh please disappear for a while.” Burying my head under the sand, so to speak. But then I know it’s better done now, than once she’s here. Only she knows when she’s ready. And I’m happy to let her decide. Though I do wish she’d stop doing whatever it is she’s doing to my crotch. Because it really bloody hurts! I am hoping that as I am writing this comment that your little girl is here or you are about to meet her. I think the last couple weeks are the worst. You want to cherish every moment with your first born but also so anxious to meet your new baby. I found it very emotional going from 1 to 2 children and please be gentle on yourself. It is a big change but I promise that it will soon feel like you can't imagine life before your daughter. The sibling bond is so amazing and special. Cherish those baby snuggles. The decorating can wait but she will never be this small again. I will be thinking about you the next couple weeks and early congratulations.